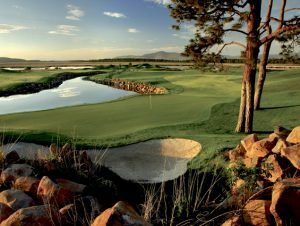 It is no accident that Central Oregon has become one of the nation’s most popular golf destinations as golfers from around the country are discovering its exceptional courses and resorts. Many have made it an annual destination for a golf trip, especially golfers from neighboring states. When you combine the outdoor activities such as biking, horseback riding, skiing, fishing, rafting and more, the area is truly a playground for families as well as golfers. The area is ranked among the top golf destinations in the world with courses like Aspen Lakes (right), Crooked River Ranch (lower right) and Tetherow (lower left). Central Oregon is also home to some of the Northwest’s top golf events like the Oregon Open, Pacific Amateur Golf Classic and Central Oregon Shootout. There is so much to see and do, Central Oregon has become a year-round outdoor recreational paradise. With more than 300 days of sunshine a year it’s easy to see why golfers and families have been attracted to this area. Here’s a closeup look at the golf courses you will find in Central Oregon. Juniper Golf Club has undergone some serious changes when in 1995 it learned that the highway bypass was coming through the golf course. City managers began to look at other options. The best one was to work on a deal with the Bureau of Land Management to acquire land just south of town and have Northwest architect John Harbottle design a new course. In July of 2005 a completely new golf course opened about two miles south of the previous course. The clubhouse opened three months later. When the new Juniper Golf Club opened for play it was a hit both on and off the course. Golf Digest took notice of the new course, naming Juniper as one of the Best New Affordable Courses (under $75) for the 2006 golf season. The new Juniper plays to over 7,100 yards from the tips and has some terrific scenery, with the Oregon High Desert serving as a dramatic background. Most holes have great views, but the view from the 14th tee is spectacular. The 15th hole gives golfers a nice view as well as this par-4 features lava rock and a large sand bunker and water. The course also hosts the Oregon Open as well. Crooked River Ranch covers 10,000 acres of rural residential, recreational and commercial property. At Crooked River, the fifth hole, Canyon Hole, is perhaps one of the most dynamic golf holes you will come across. Here you will catch a view of the beautiful Crooked River Canyon and the river from hundreds of feet above. The ultimate challenge for those worthy, is to hit the tee shot across the corner of the canyon wall to the green. At a mere 221 yards to cut the corner, it is just the fear of losing a ball and a stroke to par that makes it tough. The dogleg left hole, a 260-yard par-4, may not seem intimidating on the scorecard, but from the tee box it’s another story. Long-time Director of Golf Pat Huffer has been elected into the PGA Northwest Section Hall of Fame. Crooked River Ranch is a place for families who enjoy camping, hiking, fishing and more. Crooked River Ranch RV Park is located a short walk to the golf course, newly constructed tennis courts, pickleball courts and the swimming pool. It has 90 spaces and 20 tent spaces. The park has showers, laundry room, high speed wireless internet, and a playground. Aspen Lakes is the result of a lot of hard work and imagination by the Cyrus family who bought the land in 1987. They turned a high desert farm land into one of the jewels in Central Oregon. They celebrated their 20-year anniversary in May, 2017 and plan on making Aspen Lakes an attractive family-time venue in the next 20 years. 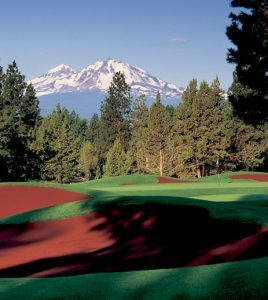 If you had to pick two things that stand out at Aspen Lakes Golf Course it would have to be the unique red volcanic crushed rock sand used in the bunkers and the great views of the mountains in the Cascade Range. Designed by Northwest golf architect Bill Overdorf, the course was named one of the “Top Ten Affordable Golf Courses” in 2001 by Golf Digest. Ponderosa pines, scented juniper trees, pristine lakes and breathtaking views of the Cascade Mountains at almost every turn make Aspen Lakes an amazing all around golf experience. It’s no wonder it is a popular place for families and as well as corporate outings. A new rustic clubhouse adds to the golfing experience. 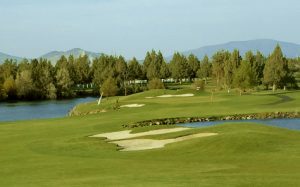 The course hosts one of the top team tournaments each year with the Central Oregon Shootout that takes place each April. Visit www.aspenlakes.com for more information. Surrounded by majestic, snowcapped Cascade Mountains, Eagle Crest Resort is located along the Deschutes River, just west of Redmond and north of Bend. Named to Golf Digest ‘Best Place to Play’ in 2008 and 2009, guests return year-after-year for the Resort’s 54 holes of golf (three courses) and unlimited golf packages. They also return for the fully renovated Lodge at Eagle Crest, well-maintained vacation homes, three sport centers, indoor and outdoor pools, multiple tennis, basketball and volleyball courts, miles of hiking and biking trails, spa, and countless recreational pursuits throughout Central Oregon. When it comes to golf, challenge, variety and value are the top priorities at Eagle Crest Resort. With two championship golf courses, the par-63 Challenge Course, and a popular 18-hole putting course, links lovers are never far from their favorite pastime. Four sets of tees on each course allow the more experienced golfers plenty of challenge, and the less experienced equally enjoyable rounds. And thanks to the lower elevation, The Ridge and Challenge Courses remain open all winter long. • The Ridge Course – Host of the 1999 and 2002 Northwest Open, and 2006 Oregon Open. • The Resort Course – Host of the 2011 Pacific Amateur and Oregon High School State Golf Championships since 1991. • The Challenge Course – Named the Pacific Northwest’s best short course by LINKS Magazine in 2006. Black Butte Ranch is one of those special places that not only has plenty of family activities, but also offers two golf courses to choose from. With the Big Meadow and Glaze Meadow golf courses, Black Butte is a golfer’s paradise. Each course is provides a different, yet challenging golf experience and both are worth the trip to Central Oregon. Big Meadow underwent a bunker renovation a few years ago. With the new and remodeled bunkers, the course is even more challenging. The Big Meadow course has undergone changes as well and now features new tee boxes on every hole. The Glaze Meadow course was shut down for a year to complete re-model, by Northwest architect John Fought. The new No.1 hole is a gentle dogleg par-4 and the old twisting par-5 is gone. Behind the first green, trees have been removed for a look at other holes. New bunkers and tees make you feel like you are seeing a new course at Glaze Meadow. Running Y Ranch, Southern Oregon’s only full-service destination resort, is home to the Arnold Palmer Signature Course, Arnold’s only course in Oregon. Situated in the heart of the breathtaking Cascade Mountain range, just across the California boarder on the shores of Klamath Lake, the resort’s exceptionally mild climate and 300 days of sunshine add up to a four-season recreational paradise. The Arnold Palmer Signature Course at Running Y Ranch is consistently rated one of the country’s best When Arnold Palmer was asked to pick a favorite golf course from his many designs, he did not chose one, but 16. The list has become known as Arnold’s “Sweet 16,” and includes his course at Running Y Ranch. “The course at Running Y Ranch is one of my best tracks.” – Arnold Palmer. Lost Tracks Golf Club in Bend opened in 1996 and was carved out of a stand of Ponderosa pines with lava rock outcroppings and small lakes that give the course a nice peaceful charm. The bridge to the par-3 16th green is a railroad car, complete with everything you would find in a passenger car including the many bag tags left by golfers from other courses. The course got its name after construction workers found old railroad spikes and train tracks during the early stages of course preparation. Under owner Brian Whitcomb (former PGA of America President), Lost Tracks has made significant changes. The most recent change is dramatic – the removal of trees and between the 13th and 14th holes and the construction of a series of water features between the two holes, which includes ponds connected with a stream. River’s Edge Golf Course in Bend is known for its challenging layout and for good reason. The course sits on a hillside and features rolling fairways and undulating greens. Along with its challenges, golfers should be pleased with the amount of positive changes the course has undergone. Tee boxes have been leveled, the fairway on the second hole has been made level, trees and limbs have been removed for better sight lines and the fairway on No. 17 hole has been widened. There are plenty of private country clubs in the Central Oregon area as well as public courses. 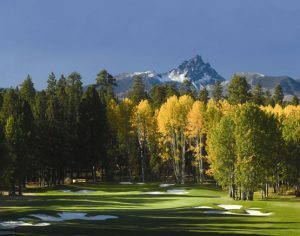 In Bend, there are three of the top courses in the state with Bend Golf and Country Club, Broken Top and Awbrey Glen. Bend Golf and Country Club is the oldest, having opened its original nine holes for play around 75 years ago. It became an 18-hole course in 1974 and renovations have helped keep the course up to date. Both Awbrey Glen and Broken Top opened in 1993. Awbrey Glen opened as a public course, but turned private in 2000. Pronghorn is a private golf community and has two courses, which have already received a lot of attention. One is a Jack Nicklaus course and the other is a Tom Fazio course. If you are seeking a variety of incredible golf courses and want to stay in one place, then Sunriver Resort is the place for you. The Meadows and Woodlands courses are both beautiful and challenging, but are often are overshadowed by the attention given to the award-winning Crosswater. 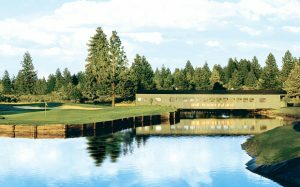 Sunriver is a popular resort for families in winter and summer and has all of the activities that you would expect to find at a top resort including a spa, many dining options, a fitness center, and of course the golf. A newest course called Caldera Links is located next to Crosswater, and is a perfect place for your short game practice, although there are some longer holes. Sunriver’s Crosswater course, designed by Bob Cupp and John Fought, is perhaps one of the most visually pleasing courses you will ever come across. The Little Deschutes River runs through the course and comes into play on many of the holes. Mount Bachelor is visible from several holes and the Deschutes River also can be seen. The course was ranked in the top 100 Greatest in the country by Golf Digest and is ranked third in the state. Widgi Creek Golf Club in Bend seemed to be in trouble in December of 2004 when the course went into bankruptcy, but Portland businessman Barry Helm stepped in, bought the course and immediately has made some noticeable changes. In order to get the course back to pristine condition, Helm purchased a new fleet of maintenance equipment. He also improved the irrigation system and has renovated the clubhouse, including the kitchen and restaurant. Helm’s improvements have made Widgi Creek a place you want to stop at when playing golf in Central Oregon. Meadow Lakes Golf Course in Prineville has an interesting background. In 1988 the city of Prineville was looking for a way to treat its water after facing fines of up to $25,000 a day. The solution was to build some water treatment ponds – and build a golf course around the ponds, which became the Meadow Lakes Golf Course. Today, Meadow Lakes is an environmentally friendly golf course that presents a links-style layout with several water hazards to keep you focused. One of those hazards comes into play on the very first hole, a par-5 dogleg right. 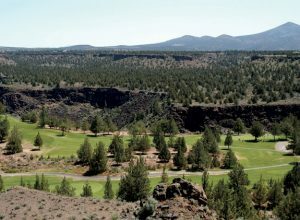 Quail Run had always been thought of as a terrific nine-holer, but when nine new holes were built, the course suddenly became a Central Oregon hot spot. Quail Run plays to nearly 7,000 yards from the tips and features mountain and desert views. Located just south of Sunriver, the course is worth the few extra miles south. When Tetherow Golf Club in Bend opened for play the course was an award winner right out of the gate. Many of the top golf publications around named Tetherow as one of the top new courses. And for good reason. The David McLay Kidd design is a challenging layout and offers links golf. The greens are large and undulating and the fairways have some small bunkers to grab those errant shots. New lodging has helped raise the bar at Tetherow as well. Brasada Canyons, named Best Resort in the Pacific Northwest by Condé Nast Traveler, offers amazing golf, top-notch service, and a front row seat to the natural wonder of Central Oregon. 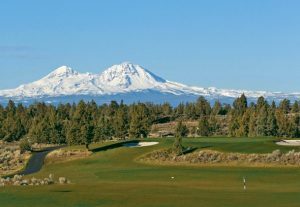 Designed by native Oregonian Peter Jacobsen and Jim Hardy, the course just outside Bend is undeniably one of Central Oregon’s most beautiful and enjoyable. There are 18 distinctive and challenging holes that wind through, across and along the canyons, beginning from 3,272 feet above sea level and climbing to just over 4,000. Here your ball soars farther, as does your eye, with dramatic, unmatched views of snowcapped Cascade Mountains from nearly every hole. Eighteen holes at Brasada Canyons isn’t simply a day of golf, it’s an experience never to be forgotten.